You are given a rectangular grid with dimensions 50 x 50 and a supply of rectangular tiles of various sizes. Your goal is to earn as many points as possible by placing tiles on the grid. 1. 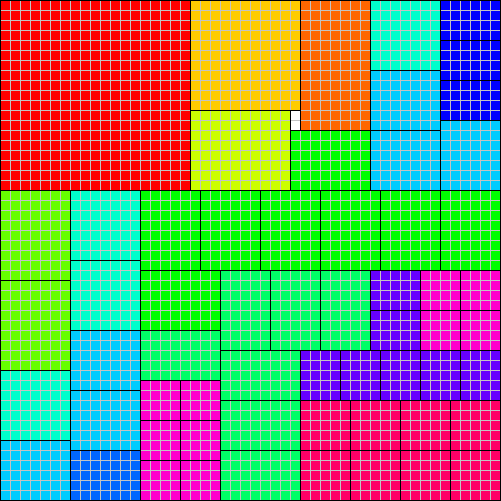 Tiles cannot overlap or extend outside the grid. 2. Tiles must line up with the grid lines, so they can only be rotated by 90 degrees. 4. For every tile dimension that is not a factor of 50, you earn 2 bonus point (for placing that tile). So a M x N tile will give you P+4 points if neither N nor M is a factor of 50. TIP: You can gauge your "efficiency" by taking the ratio of your total points over 2500. For example, using only 5x5 tiles, you will get 1500 points which yields 1500/2500 = 0.6 efficiency. Last edited by Cradarc on Thu Mar 03, 2016 9:08 pm UTC, edited 1 time in total. Here's a solution using six 5x5 tiles and all of the others. Only 17 squares are left empty. Here's one that fills it completely. Nine 5x5's are used. It's my PolyForm Puzzle Solver Java applet on my puzzle site. If you can't get it to run in your browser, you can download it and run it standalone instead. Nice job filling in the whole grid. If I'm doing the math right, that's 1934 points. On the other hand, there's no penalty for leaving squares unfilled. Here's my solution: it leaves 2 squares unfilled and scores 1942 points. I used 8 5x5 tiles and discarded a 5x4 and a 5x3. Somebody check my work - unless I made a mistake, some dynamic programming should prove that 1942 is the maximum.